Your home, the land it sits on, and your neighborhood are your own little slice of heaven. We light the night for beauty, safety, and security. TerraCast® leads the way with up-front and over-time savings, plus, you’ll have the peace of mind that comes with innovative, maintenance-free products. Now that’s heavenly! Light poles illuminate the night and shed light in the dark so we can see where we’re going, what we’re doing, and what’s going on around us. During the day, they’re still starkly visible, so a beautiful, maintenance-free option is always the best choice. TerraCast® is the number one manufacturer in the world for innovative resin products. Our Classic PolySteel® lampposts weigh five to ten times LESS than light poles made from metal or concrete. They’re less costly to make, ship and install, making them lighter on your budget. Our bollards and landscape lighting are made the same way, and are a brilliant option for your backyard, swale or garden. Our luminaire covers are made of resin, polyurethane, or acrylic, materials that don’t shatter, so a stray ball won’t leave you in the dark. TerraCast® uses a Linear Low Density Polyethylene Resin to make the outer layer of our PolySteel® lampposts. The inner core is galvanized steel or fiberglass, which is completely encased in a layer of polyurethane foam, isolating the core and protecting it from corrosion. The outer layer of resin is a quarter-inch thick. LLDPE resin is a member of the plastic family, formulated to be outdoors for many years. Because of its non-porous, non-hydroscopic nature, nothing sticks to it, and nothing gets through it. That means it won’t stain or discolor from dirty water or rusty sprinkler pipes. It also means that if someone spray paints on it, or the neighbor kids get a little finger-paint or marker-happy, you can easily remove any mess or stray markings with basic cleaning solution and a cleaning clothe. If it’s there for a while before you notice, or if it’s a stubborn mark, like sunbaked spray paint, don’t panic! Go get the pressure washer and spray it right off. Resin never requires sanding, polishing or re-painting. The color is blended all the way through, along with a UV inhibitor to prevent bleaching or fading, for years of worry-free beauty, out in the sunshine and weather. TerraCast® PolySteel® lampposts will never chip, crack, rust or corrode. Resin is virtually indestructible and requires zero maintenance. You can feel good about installing them, secure in the knowledge that they’ll last a lifetime, staying just as beautiful as they were the first day. All of our lighting products are backed by an industry-standard 3-year warranty. You can feel good about investing in these products. You’ll enjoy them for years and years, savoring the savings, as well as the worry-free ease of ownership. That means never having to look at a grungy, rusted old light pole, and fuss with going about repairing or replacing it. That sort of unpleasantness just doesn’t happen with resin! 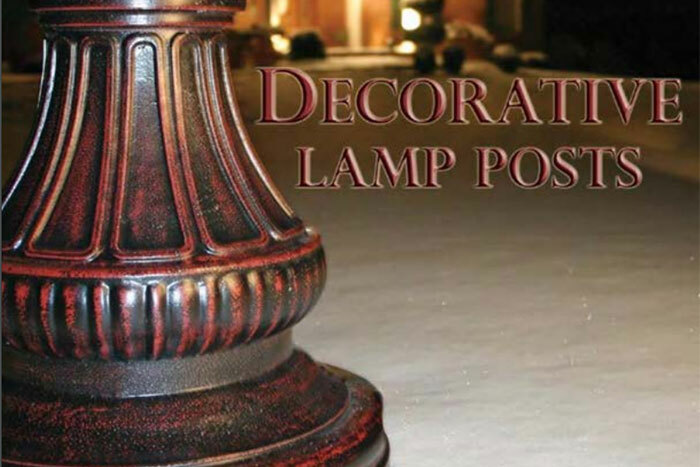 We have several standard styles in our line of Classic Lampposts. Our most popular styles are the New England and the Washington Post. The New England is a reproduction of the design found around the turn of the century, in coastal communities of the New England region. Three luminaires held out on decorative arms, surrounding a fourth, top it. The center luminaire is set a little higher, giving it an elegant candelabra effect. The Washington Post is a reproduction of the lampposts that lit Washington DC, beginning in the early twentieth century. The classic design has become a standard American look. The Washington Post comes in post heights of 7 feet and 9 feet. Depending on the selection of Luminaire, the total height will reach 7.5 feet to 12 feet. We also offer a complete line of accessories, Pole Covers, Bases and Luminaires, to accommodate any kind of install. Whether you just want to beautify and protect your existing pole with resin upgrades, or remove and replace your old poles with PolySteel® Lamp Posts, we have everything you’ll need. We can even customize your products, so you’ll have something totally unique!! Our PolySteel® lampposts come in standard black and white, and we offer a faux-steel look, which is that silvery-black you’d expect to see on a new steel light pole. We can make them for you in any color you’d like, even one of our granite blends, and we can match, or create any color you like, or even create a new stone blend just for you. TerraCast® is a green company. We’re members of the US Green Building Council. We use sustainable practices in our factories. Our resin is made up of up to 100% post-consumer recycled materials, and we use natural gas in our ovens, and reclaimed water in our cooling chambers. TerraCast® is also a Red, White & Blue company! Bob Grossman and his partner Tom Scheidel, founded our original company, Roto-Cast, in 1969. We love this country and we support the American economy. We employ American citizens in our factories, which are all on US soil, and we use American made materials. Bob’s grandson, Brad Goldring, is now the company’s President and CEO. We like to keep it in the family, the American Family. So when you purchase from TerraCast®, you are saving money, you’re supporting the American economy, and you’re helping to save the planet!